Orlando Work injury & Worker's Compensation Attorney | Michael J MacDonald, P.A. 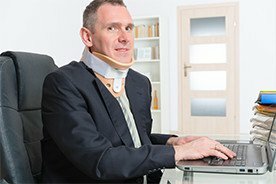 Workers’ compensation is actually an insurance that the employer is required by law to have in case an employee is injured while working/on the job, becomes temporarily/permanently disabled, becomes ill due to circumstances surrounding their job, or even if unfortunate death results from their job. It’s mandatory that all employers who have 4 or more employees working part-time or full-time provide workers’ compensation insurance. If you feel like your employer doesn’t have the proper insurance in place, get in touch with a workman comp lawyer to get started on protecting your rights when you’re on the job. The first thing you or someone you know should do if they have been injured at work is to document the circumstance as detailed as possible in writing and report the matter to a supervisor. The sooner it is reported, the more likely the case can be resolved. As experienced workers’ compensation attorney in Orlando, the entire team at Michael J. MacDonald, P.A. is dedicated to protecting your legal rights. The next step is to speak with a workers’ compensation lawyer, and our consultations are always free. Our team can provide you with all of the necessary information to move forward with your case to ensure you get the best possible outcome. Remember, after an injury, you are entitled to medical attention, disability payments, and a host of other workers’ compensation services. Get the right information so your legal case gets solved efficiently – call Florida’s premier workers’ compensation lawyers in Orlando, Michael J MacDonald, P.A. Workers’ compensation is designed to help you recover in the best way possible with the least amount of toll on your bank account since the accident was a result of you being at your workplace. It is understandable that you need to recover as best and as quickly as possible in order to return to work, so it’s in both you and your employer’s best interest that you get the best medical care possible. By utilizing workers’ compensation, you won’t have to worry about spending extra money to recover from your injury, regardless of whether it’s small or serious. It is important to remember that some circumstances do not fall under workers’ compensation requirements. Social activities outside of a work environment that are work related are usually not covered. Any outing where attendance is not specifically required by the employer is usually not covered. Unless specified in a contract, any transportation to and from employment that does not directly relate to employment duties is not covered. If you are unsure about a circumstance in which you have been injured, contact Michael J MacDonald, P.A. for more information on workers’ compensation requirements. If you have been denied workers’ compensation benefits, you should seek the legal advice and representation of an experienced work accident lawyer to ensure you are fully aware of your legal rights. Our team can help explain how workers’ compensation is supposed to operate, ensure all of your documentation is properly prepared and submitted in a timely manner, and fight for your legal rights in workers’ compensation legal issues and disputes. If you’ve been looking for lawyer for workers’ comp, contact the law office of Michael J MacDonald, P.A. today! We are available 24/7 and our staff members speak Spanish for your convenience. Get fair compensation for your work injury by calling 407-694-9290!